Sir Knight Fowler was born on October 12, 1904, in Salisbury, Missouri. He earned an A.B. degree from Central College, Fayette, Missouri, in 1926 and an M.A. from George Washington University in 1931. He was employed as a plant pathologist for the U.S. Forest Service for thirty-four and a half years and was the author of about 75 scientific publications. Civic offices held include president of the Holindale Citizens Association, president of the International Arborists Association, and president of the Tri Ag Federal Credit Union in Pennsylvania. Brother Marvin E. Fowler of Alexandria, Virginia, served as Secretary-Treasurer of The George Washington Masonic Memorial Association for 22 years. He is survived by his wife of 47 years Roberta and two daughters India Bell Davin of Annapolis, Maryland and Terri Almacy of Frederick, Maryland. Another Daughter Marcia Statler predeceased him. Eminent Grand of the Grand Encampment, Knights Templar 1988-1991. He served as presiding officer in all four Scottish Rite bodies and was coroneted Inspector General Honorary of the 33° in 1943. In addition, he was Past Sovereign of St. Simeon Stylites Conclave of the Red Cross of Constantine; Past Prior, Francis Scott Key Priory No.14, KYCH; Past Grand Master General, Convent General, KYCH; Past Grand Master, A.M.D. ; Past Grand Chancellor, Grand College of Rites; Past Grand Preceptor, Grand College, HRAKTP; and Past Great Chief, Knight Masons of America. 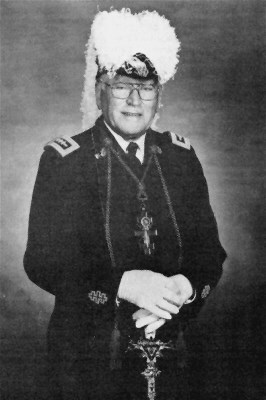 He was a Senior DeMolay and an active member of the International Supreme Council of DeMolay. In 1953 he was installed as Provincial Grand Master of the Royal Order of Scotland in the US and served for more than 40 years. He held honorary memberships in numerous Masonic bodies. The George Washington Masonic Memorial benefited greatly and prospered during the many years he served as Secretary-Treasurer. The Freemasons of America owe Brother Fowler a debt of gratitude not only for all he did for the Memorial but for all he did for Freemasonry. The following Eulogy was presented by Most Worshipful Brother Stewart W. Miner, Past Grand Master of the Grand Lodge of Virginia and Grand Secretary of the Grand Lodge, F.A.A.M. of the District of Columbia, at the Masonic Services for Past Grand Master Marvin E. Fowler. William Shakespeare once wrote that some men are born great, some achieve greatness, and some have greatness thrust upon them. At the time he penned those words, Shakespeare must have had in mind someone like Marvin Fowler, a man who by word and deed achieved unusual Masonic greatness; in this achievement, he also made the Fraternity great. To be born great is an act of providence, and it is clearly providential that Marvin Fowler was endowed by his Creator with unusual intellect, physical stamina, an inquisitive mind, a pleasant personality, and an extraordinary appreciation of his personal obligation to use all of these gifts of God properly. Indisputably, Marvin Fowler was born to be great. Also it is indisputable that Marvin achieved greatness, not because of his endowment but because of his apt application of his God-given talents, always facing the challenges of life with confidence and optimism. For almost 75 years he busied himself by serving every major Masonic body, subordinate or Grand, and always with distinction. In the process he took no short cuts; his was a working sojourn through the quarries of Masonry. It is equally clear that because of his skill and the superior quality of his performance, greatness was thrust upon him from all quarters: Following his service as Grand Master of Masons of the District of Columbia, he was called upon to lead significant sectors of the Craft, nationally and internationally, and under his leadership those sectors of the Craft for which he was responsible thrived. Marvin was in a class by himself, and his death indeed marks the end of a Masonic era, not only in the Grand Lodge of the District of Columbia but throughout the Masonic world. Marvin was not known as "Mr. Mason" for nothing. It was a title he never sought, but one that was bestowed upon him by his fellow Masons as a token of their love and respect. His passing leaves a void that will remain as long as the countless Masons who know him and worked with him have memory. The affection in which he has been held is indicated, in part, by the honors that have been heaped upon him. He received the Distinguished Service Medal of the Grand Lodge of the District of Columbia, the Henry Price Medal of the Grand Lodge of Massachusetts, the Henry Johnson Medal of the Grand Lodge of New York, the Joshua Hayden Drummond Award of the Grand Lodge of Maine, the Albert Gallatin Mackey Medal of the Grand Lodge of South Carolina, the Daniel Cox Medal of the Grand Lodge of New Jersey, and the Thomas J. Shryock Medal of the Grand Lodge of Maryland. Throughout the years Marvin's greatness was self achieved, the result, in part, of his inability or rather unwillingness to say no to his contemporaries. One task inevitably led to another, and in consequence, Marvin was never without Masonic employment. And through it all Marvin continuously enunciated what he believed were the essentials of life-concerns about the interrelationships of men; concerns about how man uses or misuses his intellectual resources; concerns about how men in the fraternity act; and concerns, particularly, about how people, in general adapt to change. The enormity of his concerns was established in his report to the Grand Lodge in 1950 when he stated that: "We are not alarmed about the condition of our craft...but we are fearful for the future of the human race. Only a few short years ago we congratulated ourselves that peace had been restored to the world after its most bloody conflict. Men of great vision and lofty ideals sought to discover the means with which to end warfare for all time, and many believed they were successful in their endeavors. Yet warfare never ceased. Today, as we meet, our nation is in a state of emergency, and we are engaged in what may prove to be our most crucial struggle for freedom. As Masons and loyal citizens of a free land, we are obliged to aid in this struggle against tyranny and oppression . . . Let us work and pray for the day when truth and justice will prevail throughout the world". What Marvin said in 1950 is as apropos today as it was then. He was a man ahead of his time; a giant in the Craft; an organizational genius, and, unfortunately, his equal is at the moment not in sight. But we take solace in the fact that by his labors in hundreds of Masonic bodies, he established a foundation on which his survivors may build in preparation for a new day, a better day, and a day in which greater insight and appreciation of the true meaning of brotherly love and affection may be realized. Good bye, dear friend, good bye. You have made your mark. It will be remembered. You have satisfied the Chief Overseer and are entitled to your wage. Pass on, Brother, pass on.